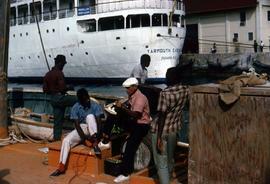 Colour Kodachrome 35mm slide depicts a group of men sitting on a dock with a ship in the background. Colour Kodachrome 35mm slide depicts a group of people sitting in chairs on a boat. 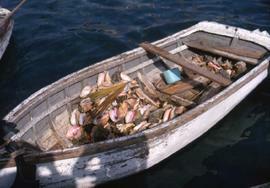 Colour Kodachrome 35mm slide depicts a man sitting in a boat shucking conch shells. Colour Kodachrome 35mm slide depicts men standing on a sailboat with their backs to the camera. Colour Kodachrome 35mm slide depicts people walking on a dock. In the centre is a woman in a yellow dress. Colour Kodachrome 35mm slide depicts a sailboat with two buildings in the background. Colour Kodachrome 35mm slide depicts two men shucking conch shells on a sailboat.